Darby, John and Falco, Carla 2019. Healthcare-Associated Infections in Children. p. 57. Martin, Niels Pascual, Jose L. Crowe, Dennis T. (Tim) Toevs, Christine Cerada, Maurizio F. Mikkelsen, Mark and Kaplan, Lewis J. 2018. Comfort at the crossroads. Journal of Trauma and Acute Care Surgery, Vol. 84, Issue. 6, p. 978. Maheshwari, Rahul Gupta, Aashu Ganeshpurkar, Aditya Chourasiya, Yashu Tekade, Muktika and Tekade, Rakesh K. 2018. Dosage Form Design Parameters. p. 621. Stull, Jason W. Hoffman, Cydney C. and Landers, Timothy 2018. Health Benefits and Risks of Pets in Nursing Homes: A Survey of Facilities in Ohio. Journal of Gerontological Nursing, Vol. 44, Issue. 5, p. 39. Siegel, Jane D. and Guzman-Cottrill, Judith A. 2018. Principles and Practice of Pediatric Infectious Diseases. p. 10. Murthy, Rekha K. Pandrangi, Vivek and Weber, David Jay 2018. Infection Prevention. p. 219. Rugari, Susan M. Hunter, Cheryl L. and Carswell, B. Michele 2017. Animal-assisted therapy and activities in the critical care setting. Nursing Critical Care, Vol. 12, Issue. 6, p. 32. Morris, Daniel O. Loeffler, Anette Davis, Meghan F. Guardabassi, Luca and Weese, J. Scott 2017. Recommendations for approaches to meticillin-resistant staphylococcal infections of small animals: diagnosis, therapeutic considerations and preventative measures.. Veterinary Dermatology, Vol. 28, Issue. 3, p. 304. Daly, Russell F. House, Jennifer Stanek, Danielle and Stobierski, Mary Grace 2017. Compendium of Measures to Prevent Disease Associated with Animals in Public Settings, 2017. Journal of the American Veterinary Medical Association, Vol. 251, Issue. 11, p. 1268. Stevens, Penelope Kepros, John P. and Mosher, Benjamin D. 2017. Use of a Dog Visitation Program to Improve Patient Satisfaction in Trauma Patients. Journal of Trauma Nursing, Vol. 24, Issue. 2, p. 97. Levey, Janet A. and Chappy, Sharon L. 2017. Service Dogs in the Perioperative Setting. AORN Journal, Vol. 105, Issue. 4, p. 365. Linder, Deborah E. Siebens, Hannah C. Mueller, Megan K. Gibbs, Debra M. and Freeman, Lisa M. 2017. Animal-assisted interventions: A national survey of health and safety policies in hospitals, eldercare facilities, and therapy animal organizations. American Journal of Infection Control, Vol. 45, Issue. 8, p. 883. Pellegrino, Laurel D. Cerimele, Joseph M. and Dubovsky, Amelia N. 2016. Service Dogs in the Hospital: Helpful or Harmful? A Case Report and Clinical Recommendations. Psychosomatics, Vol. 57, Issue. 3, p. 301. Coleman, Jennifer A. Green, Brooke Garthe, Rachel C. Worthington, Everett L. Barker, Sandra B. and Ingram, Kathleen M. 2016. The Coleman Dog Attitude Scale (C-DAS): Development, refinement, validation, and reliability. Applied Animal Behaviour Science, Vol. 176, Issue. , p. 77. Longworth, Sarah A. Avery, Robin K. Curless, Melanie S. and Longworth, David L. 2016. Transplant Infections. p. 823. Hardin, Pam Brown, Janice and Wright, Mary Ellen 2016. Prevention of transmitted infections in a pet therapy program: An exemplar. American Journal of Infection Control, Vol. 44, Issue. 7, p. 846. Abrahamson, Kathleen Cai, Yun Richards, Elizabeth Cline, Krista and O'Haire, Marguerite E. 2016. Perceptions of a hospital-based animal assisted intervention program: An exploratory study. Complementary Therapies in Clinical Practice, Vol. 25, Issue. , p. 150. Address correspondence to David J. Weber, MD, MPH; 2163 Bioinformatics, CB #7030, Chapel Hill, NC, 27599-7030 (dweber@unch.unc.edu). 1. Association of American Pet Products. Pet industry market size and ownership statistics. http://www.americanpetproducts.org/press_industrytrends.asp. Published 2014. Accessed 1 November 2013. 2. Weese, JS, Caldwell, F, Willey, BM, et al. An outbreak of methicillin-resistant Staphylococcus aureus skin infections resulting from horse to human transmission in a veterinary hospital. Vet Microbiol 2006;114:160–164. 3. Lefebvre, SL, Golab, GC, Christensen, E, et al. 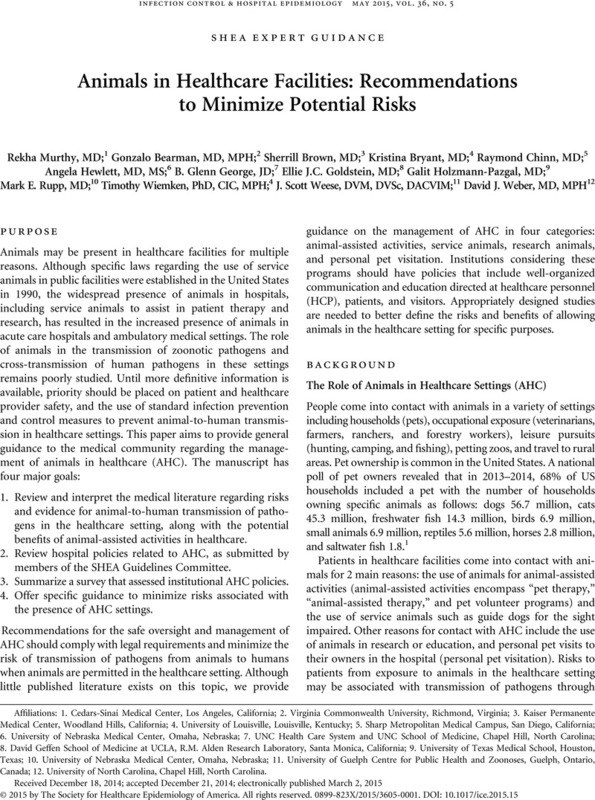 Guidelines for animal-assisted interventions in health care facilities. Am J Infect Control 2008;36:78–85. 4. Lefebvre, SL, Reid-Smith, RJ, Waltner-Toews, D, Weese, JS. Incidence of acquisition of methicillin-resistant Staphylococcus aureus, Clostridium difficile, and other health-care-associated pathogens by dogs that participate in animal-assisted interventions. J Am Vet Med Assoc 2009;234:1404–1417. 5. Oehler, RL, Velez, AP, Mizrachi, M, Lamarche, J, Gompf, S. Bite-related and septic syndromes caused by cats and dogs. Lancet Infect Dis 2009;9:439–447. 6. Heydemann, J, Heydemann, JS, Antony, S. Acute infection of a total knee arthroplasty caused by Pasteurella multocida: a case report and a comprehensive review of the literature in the last 10 years. Int J Infect Dis 2010;14 Suppl 3:e242–e245. 7. Abrahamian, FM, Goldstein, EJ. Microbiology of animal bite wound infections. Clin Microbiol Rev 2011;24:231–246. 8. Sehulster, L, Chinn, RY, CDC, HICPAC. Guidelines for environmental infection control in health-care facilities. Recommendations of CDC and the Healthcare Infection Control Practices Advisory Committee (HICPAC). MMWR Recomm Rep 2003;52(RR-10):1–42. 9. ADA: Americans With Disabilities Act of 1990. 1990. Pub. L. No. 101-336, 104 Stat. 328. http://www.dol.gov/dol/topic/disability/ada.htm. Accessed August 16, 2014. 10. Guyatt, GH, Oxman, AD, Vist, GE, et al. GRADE: an emerging consensus on rating quality of evidence and strength of recommendations. BMJ 2008;336:924–926. 11. Centers for Disease Control and Prevention. B Virus (herpes B, monkey B virus, herpesvirus simiae, and herpesvirus B). http://www.cdc.gov/herpesbvirus/firstaid-treatment.html. Published 2014. Accessed August 10, 2014. 12. Serpell, J. Animal companions and human well-being: an historical exploration of the value of human-animal relationships. In: Handbook on Animal-Assisted Therapy: Theoretical Foundations and Guidelines for Practice . Waltham, MA: Academic Press, 2000, p. 3–17. 13. Velde, B, Cipriani, J, Fisher, G. Resident and therapist views of animal-assisted therapy: Implications for occupational therapy practice. Austr Occup Ther J 2005;52:43–50. 14. Draper, RJ, Gerber, GJ, Layng, EM. Defining the role of pet animals in psychotherapy. Psychiatr J Univ Ott 1990;15:169–172. 15. Allen, DT. Effects of dogs on human health. J Am Vet Med Assoc 1997;210:1136–1139. 16. Friedmann, E, Son, H. The human-companion animal bond: how humans benefit. Vet Clin North Am Small Anim Pract 2009;39:293–326. 17. Gammonley, J. Animal-assisted therapy: therapeutic interventions. Renton, WA: Delta Society; 1997. Delta Society. ISBN: 1889785032. Accession Number: 12028669. 18. U.S. Department of Justice CRD, Disability Rights Section. ADA Requirements: Service Animals. http://www.ada.gov/service_animals_2010.htm. Published 2011. Accessed August 2014. 19. Anderson, LC, Leary, SL, Manning, PJ. Rat-bite fever in animal research laboratory personnel. Lab Anim Sci 1983;33:292–294. 20. Davenport, DS, Johnson, DR, Holmes, GP, Jewett, DA, Ross, SC, Hilliard, JK. Diagnosis and management of human B virus (Herpesvirus simiae) infections in Michigan. Clin Infect Dis 1994;19:33–41. 21. Wilson, BA, Ho, M. Pasteurella multocida: from zoonosis to cellular microbiology. Clin Microbiol Rev 2013;26:631–655. 22. Pedrosa, PB, Cardoso, TA. Viral infections in workers in hospital and research laboratory settings: a comparative review of infection modes and respective biosafety aspects. Int J Infect Dis 2011;15:e366–e376. 23. Dorsett-Martin, WA. Considering Q fever when working with laboratory sheep. Lab Anim (NY) 2010;39:86–89. 24. Saito, T, Ohnishi, J, Mori, Y, Iinuma, Y, Ichiyama, S, Kohi, F. Infection by Chlamydophilia avium in an elderly couple working in a pet shop. J Clin Microbiol 2005;43:3011–3013. 25. Aly, R. Ecology and epidemiology of dermatophyte infections. J Am Acad Dermatol 1994;31:S21–S25. 26. Wade, JW, Brabham, RF, Allen, RJ. Medicinal leeches: once again at the forefront of medicine. South Med J 1990;83:1168–1173. 27. Valauri, FA. The use of medicinal leeches in microsurgery. Blood Coagul Fibrinolysis 1991;2:185–187. 28. Lineaweaver, WC, O’Hara, M, Stridde, B, Valauri, FA, Buncke, HJ. Clinical leech use in a microsurgical unit: the San Francisco experience. Blood Coagul Fibrinolysis 1991;2:189–192. 29. Dabb, RW, Malone, JM, Leverett, LC. The use of medicinal leeches in the salvage of flaps with venous congestion. Ann Plast Surg 1992;29:250–256. 30. Wells, MD, Manktelow, RT, Boyd, JB, Bowen, V. The medical leech: an old treatment revisited. Microsurgery 1993;14:183–186. 31. Lineaweaver, WC, Hill, MK, Buncke, GM, et al. Aeromonas hydrophila infections following use of medicinal leeches in replantation and flap surgery. Ann Plast Surg 1992;29:238–244. 32. Lineaweaver, WC. Aeromonas hydrophila infections following clinical use of medicinal leeches: a review of published cases. Blood Coagul Fibrinolysis 1991;2:201–203. 33. Sartor, C, Limouzin-Perotti, F, Legré, R, et al. Nosocomial infections with Aeromonas hydrophila from leeches. Clin Infect Dis 2002;35:E1–E5. 34. Levine, SM, Frangos, SG, Hanna, B, Colen, K, Levine, JP. Aeromonas septicemia after medicinal leech use following replantation of severed digits. Am J Crit Care 2010;19:469–471. 35. Varghese, MR, Farr, RW, Wax, MK, Chafin, BJ, Owens, RM. Vibrio fluvialis wound infection associated with medicinal leech therapy. Clin Infect Dis 1996;22:709–710. 36. Mercer, NS, Beere, DM, Bornemisza, AJ, Thomas, P. Medical leeches as sources of wound infection. Br Med J (Clin Res Ed) 1987;294:937. 37. Mumcuoglu, KY, Huberman, L, Cohen, R, et al. Elimination of symbiotic Aeromonas spp. from the intestinal tract of the medicinal leech, Hirudo medicinalis, using ciprofloxacin feeding. Clin Microbiol Infect 2010;16:563–567. 38. Lineaweaver, WC, Furnas, H, Follansbee, S, et al. Postprandial Aeromonas hydrophila cultures and antibiotic levels of enteric aspirates from medicinal leeches applied to patients receiving antibiotics. Ann Plast Surg 1992;29:245–249. 39. Czachor, JS. Unusual aspects of bacterial water-borne illnesses. Am Fam Physician 1992;46:797–804. 40. Lehane, L, Rawlin, GT. Topically acquired bacterial zoonoses from fish: a review. Med J Aust 2000;173:256–259. 41. Haddad, V, Lupi, O, Lonza, JP, Tyring, SK. Tropical dermatology: marine and aquatic dermatology. J Am Acad Dermatol 2009;61:733–750; quiz 51–52. 42. Vincenzi, C, Bardazzi, F, Tosti, A, Varotti, C, Morganti, L. Fish tank granuloma: report of a case. Cutis 1992;49:275–276. 43. Gray, SF, Smith, RS, Reynolds, NJ, Williams, EW. Fish tank granuloma. BMJ 1990;300:1069–1070. 44. Huminer, D, Pitlik, SD, Block, C, Kaufman, L, Amit, S, Rosenfeld, JB. Aquarium-borne Mycobacterium marinum skin infection. Report of a case and review of the literature. Arch Dermatol 1986;122:698–703. 45. Ries, KM, White, GL, Murdock, RT. Atypical mycobacterial infection caused by Mycobacterium marinum . N Engl J Med 1990;322:633. 46. Ljungberg, B, Christensson, B, Grubb, R. Failure of doxycycline treatment in aquarium-associated Mycobacterium marinum infections. Scand J Infect Dis 1987;19:539–543. 47. Lambertus, MW, Mathisen, GE. Mycobacterium marinum infection in a patient with cryptosporidiosis and the acquired immunodeficiency syndrome. Cutis 1988;42:38–40. 48. Alinovi, A, Vecchini, F, Bassissi, P. Sporothricoid mycobacterial infection. A case report. Acta Derm Venereol 1993;73:146–147. 49. Brady, RC, Sheth, A, Mayer, T, Goderwis, D, Schleiss, MR. Facial sporotrichoid infection with Mycobacterium marinum . J Pediatr 1997;130:324–326. 50. Cassetty, CT, Sanchez, M. Mycobacterium marinum infection. Dermatol Online J 2004;10:21. 51. Schwendiman, MN, Johnson, RP, Henning, JS. Subcutaneous nodules with sporotrichoid spread. Dermatol Online J 2009;15:11. 52. Greig, JE, Carnie, JA, Tallis, GF, et al. An outbreak of Legionnaires’ disease at the Melbourne Aquarium, April 2000: investigation and case-control studies. Med J Aust 2004;180:566–572. 53. Lukin, LG. Human cutaneous myiasis in Brisbane: a prospective study. Med J Aust 1989;150:237–240. 54. Sherman, RA, Roselle, G, Bills, C, Danko, LH, Eldridge, N. Healthcare-associated myiasis: prevention and intervention. Infect Control Hosp Epidemiol 2005;26:828–832. 55. Pritchard, DI, Nigam, Y. Maximising the secondary beneficial effects of larval debridement therapy. J Wound Care 2013;22:610–11:4–6. 56. Falch, BM, de Weerd, L, Sundsfjord, A. [Maggot therapy in wound management]. Tidsskr Nor Laegeforen 2009;129:1864–1867. 57. Chan, DC, Fong, DH, Leung, JY, Patil, NG, Leung, GK. Maggot debridement therapy in chronic wound care. Hong Kong Med J 2007;13:382–386. 58. National Association of State Public Health Veterinarians IcN, (CDC) CfDCaP. Compendium of measures to prevent disease associated with animals in public settings, 2011: National Association of State Public Health Veterinarians, Inc. MMWR Recomm Rep 2011;60(RR-04):1–24. 59. Bender, JB, Shulman, SA, subcommittee AiPC, Veterinarians NAoSPH. Reports of zoonotic disease outbreaks associated with animal exhibits and availability of recommendations for preventing zoonotic disease transmission from animals to people in such settings. J Am Vet Med Assoc 2004;224:1105–1109. 60. Pickering, LK, Marano, N, Bocchini, JA, Angulo, FJ, Diseases CoI. Exposure to nontraditional pets at home and to animals in public settings: risks to children. Pediatrics 2008;122:876–886. 61. Stirling, J, Griffith, M, Dooley, JS, et al. Zoonoses associated with petting farms and open zoos. Vector Borne Zoonotic Dis 2008;8:85–92. 62. (CDC) CfDCaP. Notes from the field: outbreak of salmonellosis associated with pet turtle exposures—United States, 2011. MMWR 2012;61:79. 63. Mettee Zarecki, SL, Bennett, SD, Hall, J. US outbreak of human Salmonella infections associated with aquatic frogs, 2008–2011. Pediatrics 2013;131:724–731. 64. Lefebvre, SL, Waltner-Toews, D, Peregrine, AS, et al. Prevalence of zoonotic agents in dogs visiting hospitalized people in Ontario: implications for infection control. J Hosp Infect 2006;62:458–466. 65. Scott, GM, Thomson, R, Malone-Lee, J, Ridgway, GL. Cross-infection between animals and man: possible feline transmission of Staphylococcus aureus infection in humans? J Hosp Infect 1988;12:29–34. 66. Lyons, RW, Samples, CL, DeSilva, HN, Ross, KA, Julian, EM, Checko, PJ. An epidemic of resistant Salmonella in a nursery. Animal-to-human spread. JAMA 1980;243:546–547. 67. Richet, HM, Craven, PC, Brown, JM, et al. A cluster of Rhodococcus (Gordona) Bronchialis sternal-wound infections after coronary-artery bypass surgery. N Engl J Med 1991;324:104–109. 68. Chang, HJ, Miller, HL, Watkins, N, et al. An epidemic of Malassezia pachydermatis in an intensive care nursery associated with colonization of health care workers’ pet dogs. N Engl J Med 1998;338:706–711. 69. Mossovitch, M, Mossovitch, B, Alkan, M. Nosocomial dermatophytosis caused by Microsporum canis in a newborn department. Infect Control 1986;7:593–595. 70. Snider, R, Landers, S, Levy, ML. The ringworm riddle: an outbreak of Microsporum canis in the nursery. Pediatr Infect Dis J 1993;12:145–148. 71. Abate, SV, Zucconi, M, Boxer, BA. Impact of canine-assisted ambulation on hospitalized chronic heart failure patients’ ambulation outcomes and satisfaction: a pilot study. J Cardiovasc Nurs 2011;26:224–230. 72. Banks, MR, Banks, WA. The effects of animal-assisted therapy on loneliness in an elderly population in long-term care facilities. J Gerontol A Biol Sci Med Sci 2002;57:M428–M432. 73. Barak, Y, Savorai, O, Mavashev, S, Beni, A. Animal-assisted therapy for elderly schizophrenic patients: a one-year controlled trial. Am J Geriatr Psychiatry 2001;9:439–442. 74. Barker, SB, Pandurangi, AK, Best, AM. Effects of animal-assisted therapy on patients’ anxiety, fear, and depression before ECT. J ECT 2003;19:38–44. 75. Barker, SB, Dawson, KS. The effects of animal-assisted therapy on anxiety ratings of hospitalized psychiatric patients. Psychiatr Serv 1998;49:797–801. 76. Beck, CE, Gonzales, F, Sells, CH, Jones, C, Reer, T, Zhu, YY. The effects of animal-assisted therapy on wounded warriors in an Occupational Therapy Life Skills program. US Army Med Dep J 2012;38–45. 77. Brodie, SJ, Biley, FC. An exploration of the potential benefits of pet-facilitated therapy. J Clin Nurs 1999;8:329–337. 78. Chu, CI, Liu, CY, Sun, CT, Lin, J. The effect of animal-assisted activity on inpatients with schizophrenia. J Psychosoc Nurs Ment Health Serv 2009;47:42–48. 79. Cole, KM, Gawlinski, A, Steers, N, Kotlerman, J. Animal-assisted therapy in patients hospitalized with heart failure. Am J Crit Care 2007;16:575–585; quiz 86; discussion 87–8. 80. Edwards, NE, Beck, AM. Animal-assisted therapy and Nutrition in Alzheimer’s disease. West J Nurs Res 2002;24:697–712. 81. Edwards, NE, Beck, AM, Lim, E. Influence of aquariums on resident behavior and staff satisfaction in dementia units. West J Nurs Res 2014;36:1309–1322. 82. Jorgenson, J. Therapeutic use of companion animals in health care. Image J Nurs Sch 1997;29:249–254. 83. Kamioka, H, Okada, S, Tsutani, K, et al. Effectiveness of animal-assisted therapy: a systematic review of randomized controlled trials. Complement Ther Med 2014;22:371–390. 84. Levine, GN, Allen, K, Braun, LT, et al. Pet ownership and cardiovascular risk: a scientific statement from the American Heart Association. Circulation 2013;127:2353–2363. 85. Marcus, DA. The science behind animal-assisted therapy. Curr Pain Headache Rep 2013;17:322. 86. Moretti, F, De Ronchi, D, Bernabei, V, et al. Pet therapy in elderly patients with mental illness. Psychogeriatrics 2011;11:125–129. 87. Nepps, P, Stewart, CN, Bruckno, SR. Animal-assisted activity: effects of a complementary intervention program on psychological and physiological variables. J Evid Based Complementary Altern Med 2014;19:211–215. 88. Nordgren, L, Engström, G. Animal-assisted intervention in dementia: effects on quality of life. Clin Nurs Res 2014;23:7–19. 89. Sobo, EJ, Seid, M, Reyes Gelhard, L. Parent-identified barriers to pediatric health care: a process-oriented model. Health Serv Res 2006;41:148–172. 90. Swall, A, Ebbeskog, B, Lundh Hagelin, C, Fagerberg, I. Can therapy dogs evoke awareness of one’s past and present life in persons with Alzheimer’s disease? Int J Older People Nurs 2014; May 10 [Epub ahead of print]. 91. Willis, DA. Animal therapy. Rehabil Nurs 1997;22:78–81.